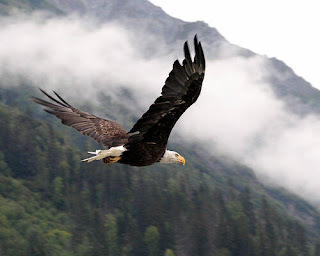 On Wings of Eagles: The Eagle and God's Design For Us. One day a boy climbing in the mountains found an eagle's nest with an egg in it. When he got home he put it under a hen along with her other eggs. When the eagle hatched he thought he was a chicken. He learned chicken behavior and scratched in the chicken yard with his 'siblings'. He didn't know any better. Sometimes he felt strange stirrings within himself but he didn't know what to do with them, so he ignored or suppressed them. After all, if he was a chicken he should behave like a chicken. One day an eagle flew over the chicken yard and the eagle looked up and saw him. In that moment he realized he wanted to be like that eagle, to fly high, to go to the mountain peaks he saw in the distance. As he spread his wings he suddenly understood that he was like that eagle. Though he'd never flown before, he possessed the instinct and capabilities. At first he flew unsteadily, then with greater power and control. Finally as he soared he knew he'd discovered his true self - the creature God made him to be. Dear Lord we pray that we would be the people that you have for us to be. Help us to always look to you for guidance. In Jesus' name, amen.